ARTBA and more than 100 other affiliates, including Transportation Construction Coalition co-chair the Associated General Contractors (AGC) of America, will take part in Infrastructure Week May 16-23. The nationwide week of events includes media coverage, education and advocacy efforts to elevate infrastructure as a critical issue impacting all Americans. The 2016 theme, “Infrastructure Matters”, is focused on telling the story of what infrastructure means to the country in terms of the economy, our quality of life, safety and our communities. It also includes reminding the public about the importance of roads, bridges, rails, ports, pipelines, the power grid and broadband. Infrastructure Week is the largest, most diverse, non-partisan coalition of organizations dedicated to strengthening America by rebuilding our infrastructure. 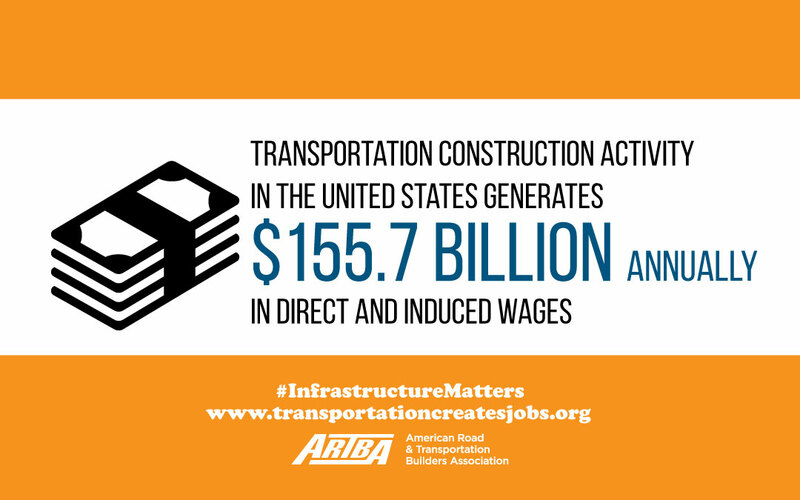 ARTBA’s economics team worked with our design team to build a series of tweets explaining the importance of the transportation construction industry to the economy, and linking to the www.transportationcreatesjobs.com website. The site shares facts about how transportation investment stimulates U.S. business activity that creates and sustains jobs. Advocacy Day in Washington, D.C. is May 18, and will include Infrastructure Week’s Congressional co-chairs Sen. Shelley Moore Capito (R-W.Va.), Sen. Ben Cardin (D-Md. ), Rep. Garret Graves (R-La. ), and Rep. Sean Patrick Maloney (D-N.Y.). More information on Infrastructure Week can be found at http://infrastructureweek.org/, or follow along on our Twitter page at https://twitter.com/ARTBA.